Charges for delivery are not included in the stated product price - see Shipping Costs (below) for details of applicable charges. Every product on this site is delivered by our standard service to most addresses across the UK and will normally arrive within 3-5 working days. For information on shipping to the Scottish Highlands, Isle of Man, Channel Islands, Scilly Isles, Northern Ireland, Republic of Ireland, Europe and beyond please contact us directly for current charges as explained in the 'Additional Shipping Cost Information' section. Orders shipped to the following detailed areas may incur an increased shipping cost. These areas include The Scottish Highlands (including, but not limited to, postcodes: AB31-38, AB40-56, IV1-28, IV30-32, IV36 & IV40, IV 52-IV54, IV63, KW1-KW14, PA21-PA38, PH4-PH41, PH49 & PH50, HS, IV41-49, IV51 -IV56, KA27 & KA28, KW15-KW17, PA20, PA41-PA49, PA60-PA78, PH42-PH44, ZE), Isle of Man, Channel Islands, Scilly Isles, Northern Ireland, Republic of Ireland, Europe and beyond. These shipping costs are applied at the checkout point and are includive of VAT. To find out more information please contact our Customer Service team by email to info@edenpetfoods.com or by phone on 01782 322409. If ordering from our website or over the phone, you will have the option at checkout to select your preferred courier (UK Mail or DPD). Additional charges may apply based on your selection. Please note that all deliveries require a signature from the customer; however if alternative arrangements or a request is made for delivery without a signature (e.g. leave in a safe place), then it is at the customer's own risk. Eden Pet Foods will not accept any liability for lost or missing goods if this option has been chosen. If you are out when delivery is attempted, the courier service should leave you a card notifying you of this and will re-attempt delivery the next working day. Delivery is attemped three times before being returned to the courier depot and ultimately to Eden Holistic Pet Foods Ltd. Please notify Eden immediately if you are in any way dissatisfied with your order. Products that have been opened cannot be returned to us due to cross-contamination. Subject to availability, we will dispatch orders placed before 2pm on a next working day service (Bank Holidays excluded). However, please allow 3-5 working days from the date of order for the consignment to reach you. If you do not receive your goods after three delivery attempts or 5 working days, please contact us and we will trace your order. Pallet orders generally take 3-5 working days to be delivered. 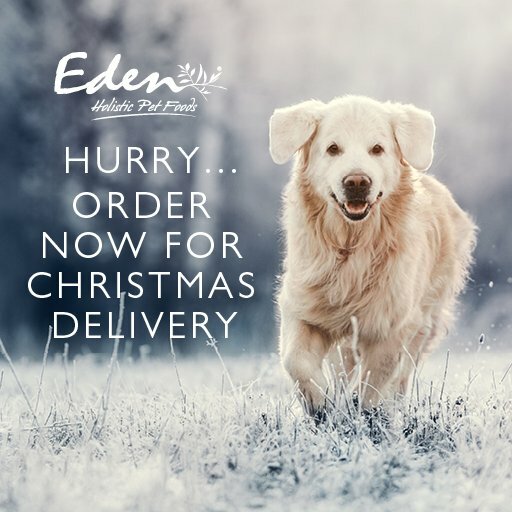 Eden may on occasion supply you with an equivalent order, e.g.. where you have ordered a 12 kg bag we may send you 2 x 6 kg, this is simply to ensure we control the stock levels so that we can provide the best service to you. If you require a specific bag size then please specify at the time of order.